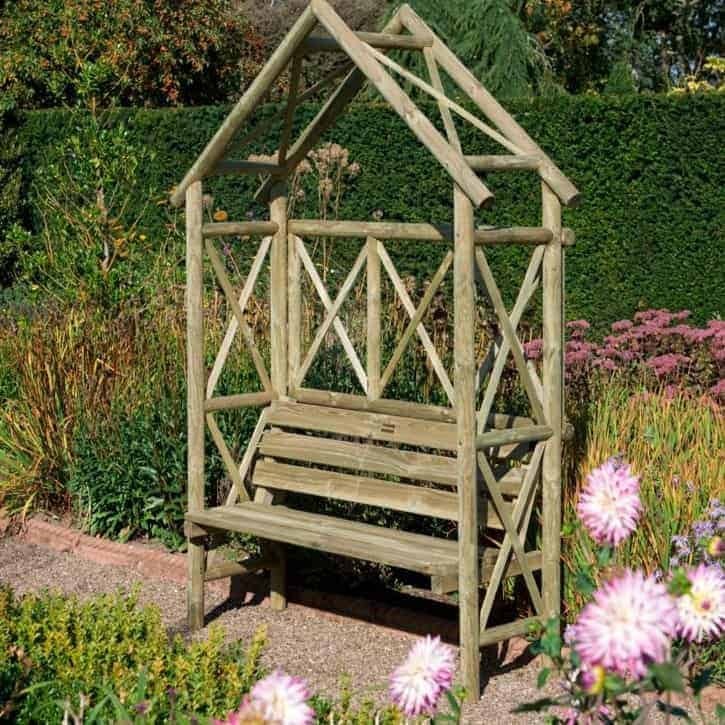 The Blooma Cottage Wooden Arbour will definitely be a major highlight your garden, with its stylish good looks that just ooze charm, you will agree that it’s a gorgeous looking bench with an arbour pointed arch and trellis sides that will make anyone who sees it say wow. You could put some trailing plants up the sides such as roses if you wanted to give it a little colour, but it will also look fantastic as it is. Sit and while away the hours on this bench with your favourite book, a glass of wine and watch the world go by in your garden. Constructed out of wood this has a 5 year anti rot guarantee. This product is home delivered. This is one of the more attractive arbours that is on the market and they have managed to make it with some very impressive materials which make it look very appealing, but also keep it strong. Solid softwood is used all throughout and to make it so that it will last lots of years it has all been pressure treated. The seating area will offer you a comfy place to sit, but the arbour as a whole is of a size which allows it to fit into any size of garden. When we do get a good summer here in the UK or perhaps a nice, warm Sunday in October, you want to get outside and make the most of it. 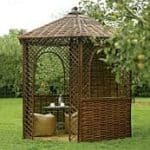 Well rather than sitting on the grass or even the wall how about sitting in your own lovely, classy and high quality arbour? This not only gives you a pleasant place to sit it is also something that is going to make your garden really look extra special. While two adults could comfortably sit on here, you do not have to worry about this taking over your whole garden. It would look lovely placed in a corner or even as a main feature. At, just over 7 feet high this is a very impressive looking structure, but at just under 2 feet deep and 5 feet 6 inches wide even more compact gardens are going to be able to enjoy this. The top of the arbour really is designed incredibly well. It is a high apex top that is made with this lovely criss cross design. So sure, you would not want to sit out here when it is raining, but we do love the way this looks. Some lights, wind chimes or another type of decoration we are sure would really make this pop, but even if you decide to leave it as it is, we are sure you are going to love the way it looks. At under £200, we really would not have been all that surprised if the sides were just left empty, but that is not the case here at all. Like the top of the arbour, a criss cross design is used here and it really does look great. We love these the way they are, but we are sure people who have green fingers may have their eyes on putting some kind of hanging plants on these. 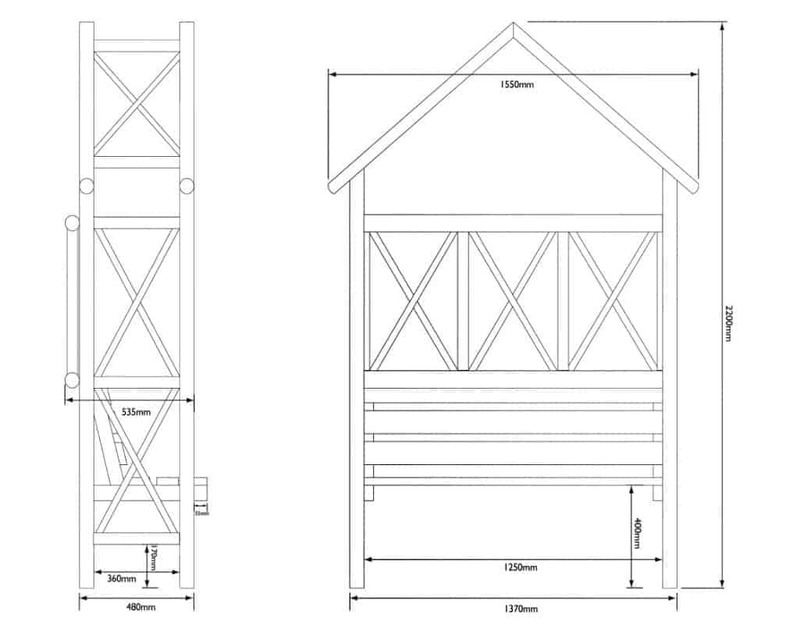 The whole structure is very solid and this as you can see from the pictures is achieved thanks to a very strong frame. 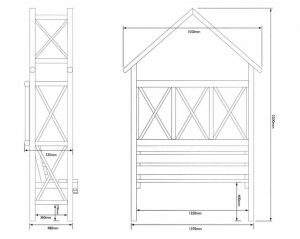 Rather than use flat wood for the frame they have gone with a cylinder design which looks amazing, but it will also make sure this is one very sturdy arbour. So it is going to be able to handle the kids or the grandkids jumping off it when you are not looking. Of course the seating area is one of the most important areas of any arbour and this one is very well made. Thick, high quality pressure treated softwood is used for the seat and it we really do like the way that this looks. As we said earlies two adults can fit on here, enjoying a glass of wine watching the sun go down, you could sneak away when you have a spare five minutes, put your feet up and enjoy a good book or you can it out here with the kids and read them a story. We really love how they have managed to put a large seat on here without making the arbour oversized and bulky. All of the softwood on the Blooma Cottage Wooden Arbour has been pressure treated which is something we always love to see, especially on something that you are going to be sitting on. Still though, you will want to give it a coating with some decent wood treatment to protect that lovely wood from rot. 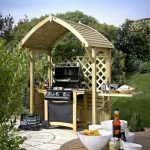 Due to the pressure treatment process the wood goes through and the high quality design, you are getting a very generous five year guarantee with this arbour. We already talked about how much we love the actual seat that is in this arbour, but actually the whole seating area is very pleasant. 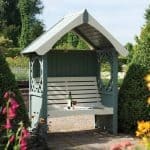 The seat is very snugly up against the side so when you first sit down, you will naturally want to rest your arm on the side of the arbour and if you are lucky enough to be sitting here by yourself then you can sit back and really stretch your arms out. In all this is just a very nice and comfortable place to spend an hour or two and watch the world go by. Some arbours will have extra space in between the seat and the frame which we know some people do like, but this one here manages to keep its compact size thanks to not doing this. 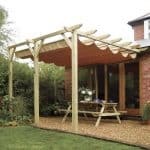 Do to the solid frame and the pressure treated softwood, you are going to be very impressed with how sturdy this arbour is. You do not have to worry about this blowing over or feeling flimsy when you are sitting on here. In all we really could not be any more pleased with how robust this arbour is. 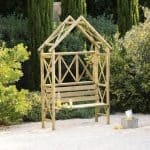 Those criss cross panels do give you a number of possibilities when it comes to customising the arbour. You could always just leave them as they are, but adding some plant life would certainly add colour to it. Or if you do not fancy sitting that close to plants, you could always brighten it up with a coating of coloured paint. The high top of the arbour also gives you the possibility to hang a number of different things from it without them being near your head. So as you can see while there is no official customisation options offered with this, you can still have a lot of fun with this arbour by changing things yourself. 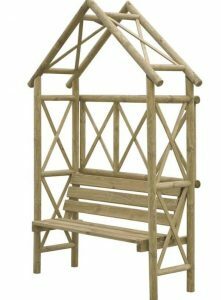 No extras are offered with this and to be honest with you unless you do want to add some flowers, paint or something else, then there is nothing you need to buy for this arbour. 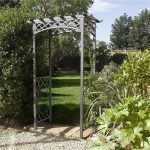 We love the whole design of this arbour. Its cylindrical frame is solid, the criss cross design looks amazing and in general it is just very high quality all throughout. Due to the all of the wood being pressure treated, you will be able to enjoy many years with this arbour. It is very low maintenance and a coating of wood treatment to give the wood protection from rot is all you have to do. 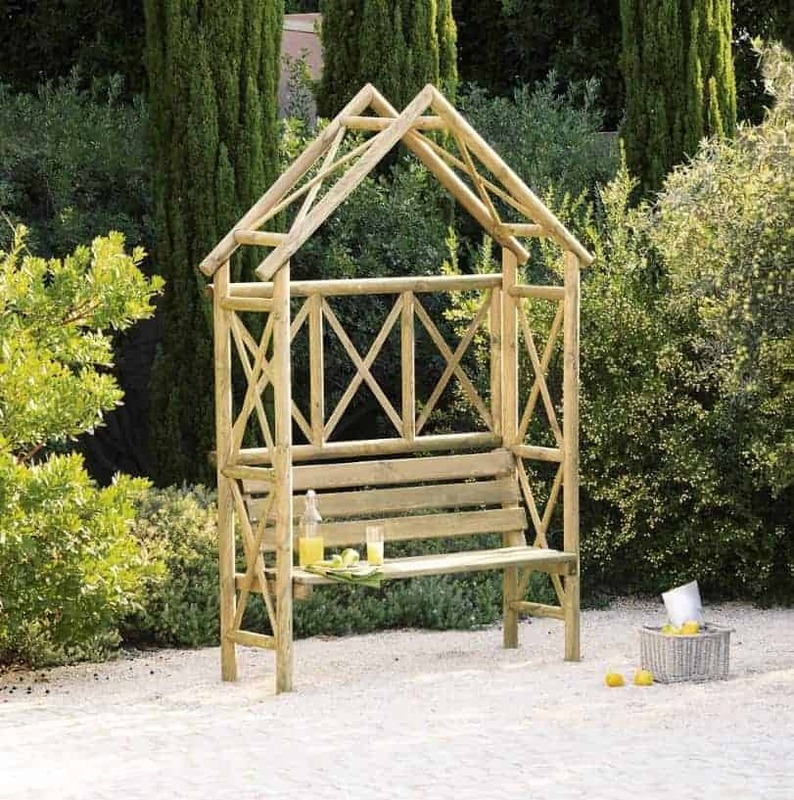 We love the size of this arbour as it offers more than enough room for two adults to fit, but at the same time it is not too large that only big gardens can enjoy this. The fact that the installation service is included with this makes it even more attractive. This really would not be all that hard a DIY job, but let’s face it why do something yourself when someone else will do it for you? Plus it does take away the chances of you slamming your hand with a hammer. At just under, £200 we feel this is a good price, but when you add in the installation service then it becomes even more attractive. We really do think this is something which is offering you a lot for your money. 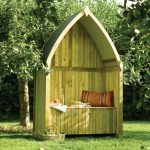 Final Thoughts: The Blooma Cottage Wooden Arbour really is a lovely, compact arbour that is ideal for gardens of all sizes. From that first picture, you can clearly see how attractive this is and to go with those good looks, we can assure you that the best and most high quality materials have been used. They have selected materials which are high quality, but not overpriced and that is why this is able to be sold at what we consider to be a fair price. You are going to love spending time sitting here on your own, with the other half or even with the kids and grandkids. You are going to be very happy adding this to your garden and at the price they are asking, your wallet is going to be very happy also. I’m an avid outdoor person. 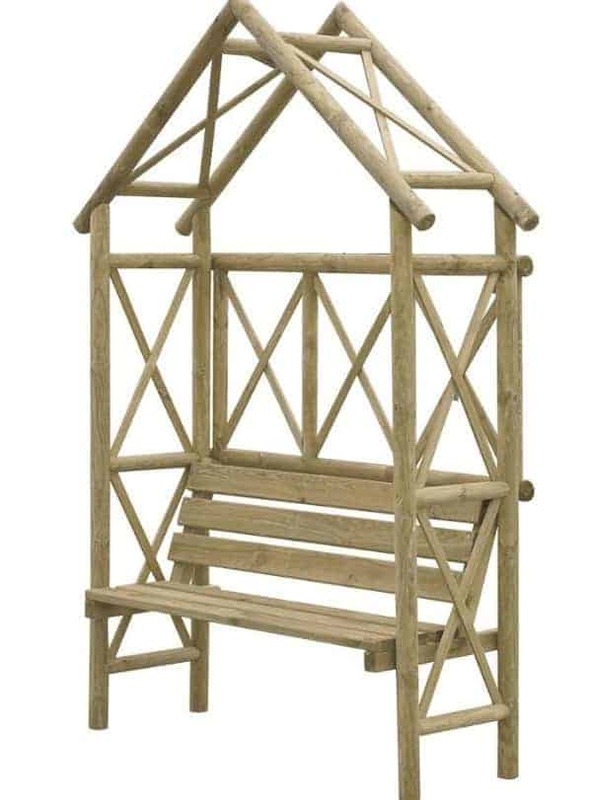 When I see this blooma cottage arbour, I knew it was something that I needed to add to my outdoor collection. I loved the fact I could put flowers going up the side of this. I am a very creative person, so dressing up the backyard of my home was something I loved to do. I liked how there was a 5 year anti rot warranty. This is constructed out of wood, and I am satisfied that this will last me for a very long time. I have always been the type of person everyone knew as the one who is different. I like things different than others would, and that is what attracted me to blooma garden arbours. I have always wanted one, but this one stood out because of the design. It wasn’t plain. It was actually stylish. I put some plants around it, and it looks amazing. I always get compliments when I have guests over. The price is better than I thought it would have been. I like to sit outside a lot. I hate to be inside cooped up. This blooma cottage arbour was the perfect way that I could soak up some sun and get out of the house. My kids loved to play outside a lot, and this was a great way for me to keep an eye on them. I could bring a book and read peacefully. I enjoyed listening to the birds in the morning as well. I planted some flowers on the sides of the arbour, and it looks amazing. I am always looking for new things for my backyard, as well as my garden. I came across this and knew I just had to have it. I can’t believe the difference it makes in my backyard. I feel like everything is neater. I had so many plants, etc. in my garden, and this just breaks it up a bit, and it is the main eye attraction. I just love it. Plus, I can paint it anything I want. I bought this for my home and I am glad I made that step to purchase it. I never buy anything like this. In fact, I am not a big decorator at all. I feel I am not good at any of that so I don’t try. However, this in itself was enough to get me in the mood to decorate. As soon as I got it home and put together, it just brought my whole backyard together. I decided to plant more and add some flowers to the side. It looked amazing. Flowers are and always have been gorgeous to me. What is even prettier is seeing them set up on arbours, especially mine. I finally purchased myself an arbour. I love it and I can decorate it anyway I want. I always painted it. It came pressure treated which was a he advantage. It was easy to paint and can withstand a lot of moving around – very sturdy!